While reassessing the recommended models in our tenor chart, we realized we didn’t need to change much – the current list still reflects some of the most popular ukes around. However, we did decide to replace Fender’s Nohea with the brand-new Fender Montecito. We also added a sixth tenor to our chart, with the affordable, beginner-friendly Cordoba 15TM. While there’s still some way to go before they reach the same status as a soprano or concert ukulele, the tenor uke is certainly growing in popularity. What Makes a Tenor Uke? What Does a Tenor Uke Sound Like? Its reputation has flourished as a performance ukulele, and is often seen on stage with legendary ukulelists such as Jake Shimabukuro, Brittni Paiva, and James Hill. With such increased popularity, there are now more tenors on the market than ever before, all showing off different styles, woods and prices. But which is the right one for you? To help you figure this out, we’ve created a chart of the top six tenor ukes that offer great style, sound and value in their respective price brackets. While the chart is not comprehensive, it certainly offers you a good snapshot of what’s hot at the moment. You’ll find some acoustic varieties and some with electronics; some under $100, with others pushing $500. However, all share that beautiful tenor sound. Let’s check them out. Beauty and balance in abundance with this high-end Cordoba uke. 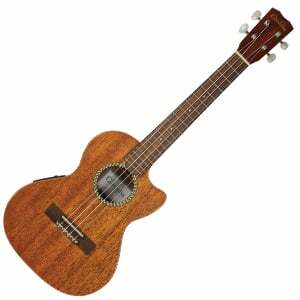 This lovely slimline uke is the perfect travel tenor. Fine detailing and a good tone from this electro-acoustic tenor. Surprising style and quality for such a budget tenor uke. The premium tenor on our chart, this delightful 30 Series ukulele from Cordoba is simple yet elegant, and uses Spanish building methods to deliver a stable and playable ukulele with a beautiful sound. The solid Sitka spruce top contrasts very nicely with the dark solid Indian rosewood on the back and sides in both looks and sound – offering great balance in tone with very good projection. As we highlight in the full review of the Cordoba 32T, there’s also a mahogany neck with a rosewood fretboard and 18 frets, while the wider nut width means it’s ultra-comfortable for players with larger hands. It also comes with an excellent Cordoba polyfoam case, which is a nice addition. While tenor ukuleles have their advantages over smaller sized ukes, they’ve never been seen as the best size for on the move – until now! This unique KA-SSTU-TE from Kala is designed specifically for travelling, with a super slim body that’s just 1.8” deep. However, acoustic volume is not a problem, with an arched back and solid top to aid projection. The top is made from spruce, while the back and sides use laminated mahogany. Joined at the 14th fret, there’s also a nice mahogany neck, with a rosewood or walnut fretboard, and a total of 18 frets. Highlighted in our complete KA-SSTU-TE review, it also comes with a B-Band pickup and preamp, for easy amplification. Great value! If you’re looking for a tenor uke with some rock n’ roll attitude, Fender’s Montecito will certainly appeal. New for 2018, the Montecito is ‘inspired by the California home of many celebrities’ as Fender explain, meaning you’re guaranteed a sumptuous style and premium feel. With excellent playability, the Montecito uses a mix of solid koa on the top with laminated koa on the back and sides, to deliver a rich and mellow tone that will get louder with time. The hardware is also impressive, with a new ‘no-tie’ bridge the highlight – meaning string changes are always quick and simple. You can check out everything about the Fender Montecito Tenor in our full review. Another classy Cordoba tenor ukulele makes its way onto our list – this time an electro-acoustic with an affordable price tag that will suit beginners and experienced players alike. It looks very sophisticated, with a solid mahogany top, and laminated mahogany back and sides. It also offers a soft cutaway for good access to the higher registers. The sleek satin-finished mahogany neck has a rosewood fretboard and 18 frets (14 in the clear), while the electronics are pretty versatile – there’s a piezo pickup and Cordoba’s UK2000q preamp, with 2-band EQ. Sound-wise there’s plenty of brightness and warmth on offer, with good projection. You can read more about the Cordoba 20TM-CE in our complete review. If you’re looking for a reasonably-priced tenor ukulele, Alvarez Guitar’s RU26T should be the first on your shortlist, with its attractive design matched by its attractive sub-$100 price tag! With a traditional non-cutaway body shape, the fan-braced top is made from spruce while the back and sides feature mahogany – all laminates, but with a quality feel and refined black ABS body binding. There’s a nice satin-finished mahogany neck, with a rosewood fretboard and a total of 18 frets. As we mention in the full review of the Alvarez RU26T, the hardware is good for the price, especially the real bone nut and saddle, and sealed tuners. A quality option for the tenor ukulelist on a budget. 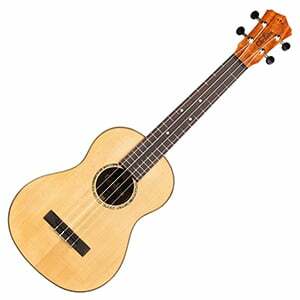 While the exact measurements may differ among manufacturers, the typical tenor ukulele length is 26” – considerably bigger than a soprano uke. A tenor ukulele will also usually have anywhere between 17 and 19 frets, although you will find some with extra frets. Just like a soprano and concert, the tenor is typically tuned G-C-E-A. 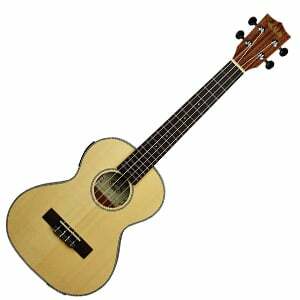 While the standard tenor ukulele will have four strings, you will find see six-string varieties too. On these, you’ll find the regular four strings (G-C-E-A), with two additional strings paired with the C and A strings. So, on a six-string tenor, your tuning would be G-C(high)-C-E-A(low)-A, with the additional strings tuned an octave higher on the C, and an octave lower on the A. For the record, none of the ukuleles in our chart are six-stringed. A typical four-string tenor ukulele has a lovely sound, and one which is slightly deeper and warmer than the tone you’d find on a concert uke. This is because the ukulele’s body is bigger, meaning you’ll also find a better projection from a tenor – perfect for acoustic performances. Naturally, the woods that make up the body – whether laminated or solid – will contribute to a different tone. So, an all-mahogany tenor uke will sound a lot warmer than one built entirely from maple. 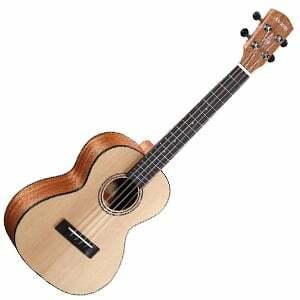 There are two main advantages to playing a tenor ukulele – sound and playability. When it comes to sound, as mentioned earlier in the article, a tenor offers players a deeper, warmer, more rounded sound with a lot more volume, when compared to a smaller sized uke, like a soprano. However, bear in mind that with a tenor you do lose some of the brightness – the traditional tinkly ukulele sound – that’s found in soprano and concert ukes. A tenor is very playable thanks to the longer scale length and wider neck. While complete beginners and children would probably be better off with a soprano or concert, beginners with bigger hands – and players moving to the ukulele from the guitar – would probably enjoy the more maneuverable experience of playing a tenor. For this reason, a tenor is also the best size for finger-pickers as there’s more space between the strings. Finally, it’s worth noting that a tenor is typically more expensive to purchase than a soprano or concert uke, with less choice in the under $100 price range compared to the smaller sizes. On the flip side, it’s usually cheaper than a baritone model to buy. We’ve highlighted some of the alternatives throughout this article, and the concert ukulele – with a length of around 23” – is the closest to a tenor in size and sound, and would suit you more if you prefer a slightly brighter sound. However, if you prefer an even deeper, louder sound, check out our page on baritone ukuleles, which highlights some of the best baritone models around. Be warned though – a baritone uke is not particularly suitable for beginners. When buying a new ukulele, there’s no right or wrong size – it all boils down to your preferred sound and how easy you find a certain size to play. As you’ve read, a tenor is a very good size for beginners or guitarists trying out the ukulele for the first time, as well as players with bigger hands due to the increased space on the fretboard. If you do opt for a tenor, the best way to decide which model suits you is to create a shortlist of models that meet your budget, then read reviews, watch videos, listen to audio samples, and try them out, if possible. You’ll eventually settle on one you love. Good luck with the search for your ideal ukulele!